* Ryder kicks off with a strong, boozy amber. * It is powerful and projects massively. * The rum burns off as a sweet pipe tobacco comes into focus. * The amber, resins, and tobacco form a sweet haze that will engulf you for hours. Summary: On first whiff, I had flashbacks to the wonderful Martin Margiela Jazz Club, a boozy tobacco scent inspired by old school men’s clubs. After wearing for a while, I realized that Ryder was basically all of my favorite absentees on top with little development. That is not a critique, but a compliment. I thought the scent was completely linear - which Mark Behnke of Colognoisseur described as WYSIWYG. After wearing a few times, I realized that there is a slight change from the initial sniff, but since most of the top notes are normally used as base notes it is hard to discern. What I get from Ryder is a robust mix of my favorite basenotes that last the life of the scent. Actually, it feels like he took the best parts of Tom Ford Amber Absolute (incense amber), Tobacco Vanilla (sweet pipe tobacco), and Jazz Club and made a powerhouse fragrance. I absolutely love the fragrance with its incredible longevity (more than a day until you shower) and its presence (strong but not overbearing). 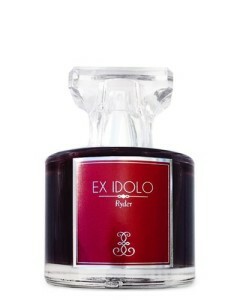 Ex Idolo Ryder is available from LuckyScent and Twisted Lily. Check out my review of Ex Idolo 33. Disclaimer: Sample purchased from Twisted Lily. Image courtesy of LuckyScent.